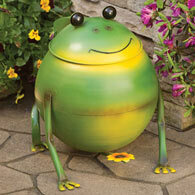 Our hand painted metal receptacle is a delightful way to dispose of your trash. Just step on the flower at its base and the cat's head pops open. A separate handled bucket is inside for easy cleaning and disposal. Stands 16" tall x 12-1/4" wide. A fun way to recycle and add a decorative accent indoors or out. *Sorry, Express Shipping and Gift Wrapping Not Available for Cat Trash Can.